Information to the constitutional principles — basic decisions of the Basic Law. A Constitutional state is a state which organs are bound to the law and the reach for justice is important. The principle of the division of power (Article 20 II GG). The principle of the regularity of all national acting (Article 20 III GG). From this and also from the Article 1 III, 19 IV and 28 I GG (here the term constitutional state is expressely listed) result, that the constitutional state ranks among the basic decisions of the Basic Law. The Separation of powers spreads the government authority, whose carrier is the people (Democracy! ), to three single, controlling each other authorities which act vicarious for the people. Through this separation an abuse of the government authority should be complicated. These three authorities are not strictly separated from each other, but affect each other mutually (for example election of the Federal Chancellor (executive) by the Bundestag (legislation)). This is called force breaking through or force penetration. 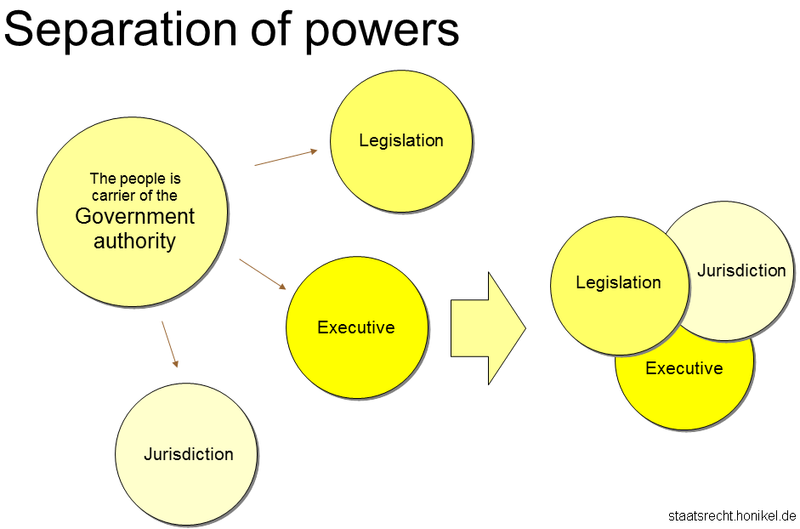 More information about Separation of powers. Priority of the law, that means acting of the state may not contradict valid right. Reservation of the law, that means the state may not act in principle without legal basis (this applies in particular if the state burdens its citizens). Basic right catalog and similar rights (Article 93 I No. 4 a GG). Binding of the state to the Basic Rights according to Article 1 III GG. At the genuine reaction facts which begun in the past and ended in the past are changed. Here in principle may not be changed worsening. At the false reaction rights, justified in the past and continuing for the future were changed for the future. Here a degradation considering the principle of proportionality and the confidence protection is possible. This constitutional principle obliged the state to protect the environment as a base of human life. Mindful also of its responsibility toward future generations, the state shall protect the natural bases of life by legislation and, in accordance with law and justice, by executive and judicial action, all within the framework of the constitutional order.